“That was the best mammogram!,” says no one ever. Those things are painful and uncomfortable. Having to be half naked in front of a stranger and all of the weird noises and pinching. I was dreading my appointment this morning when my husband called to tell me to cancel all of my appointments today because the roads were icy and he did not want me out in this 20 degree Michigan weather. I asked if he was sure because I had a 9 am mammogram appointment that I was ready to cancel and to my dismay he said I should go but to be very careful driving. And so I went. How many times have we “ignored”, “set aside”, “put on a back burner” or “rescheduled” what we are suppose to be doing for God? For me…too many to count. I am a writer. I see things which need to be written and I write my heart. My goal? To touch one heart for Jesus. To make plain that which this fallen world has made complicated. I have been in this boat before where I know I need to write but I will find every excuse in the world not to accomplish the task before me. Today I received a push from a total stranger in an uncomfortable situation. I could have 1,500 people come up to me and be like, “So when is the next book coming out? What’s it about?” and I would have some sappy reply to cover up the fact that I had not even started it. I can tell them the title and what it’s about but I have no words on paper to prove it. Recently I have been off work…10 weeks to be exact with the means of resting and writing. Have I written any words towards a book? Nope. Blogging is at a minimum. I just seem to have no motivation. I can’t even use the excuse anymore that I don’t have the means to create said book because I now have this beautiful new laptop with the right program to use to write with. So now I am back on my mission. If I can touch one person with the words I scribe it is all worth it. Enough running away from my gifting. Finished with the lies from the enemy that I am not making a difference. I am done with trying to be a writer and am accepting the words: I am a writer. Ever feel like it’s just not worth it to move any further? You just have this stupid desire to be content with what you have already accomplished and call it good? I am kinda in that boat right now. I just want to either be successful in what comes next or just stay right here. I have worked hard to build this blog. 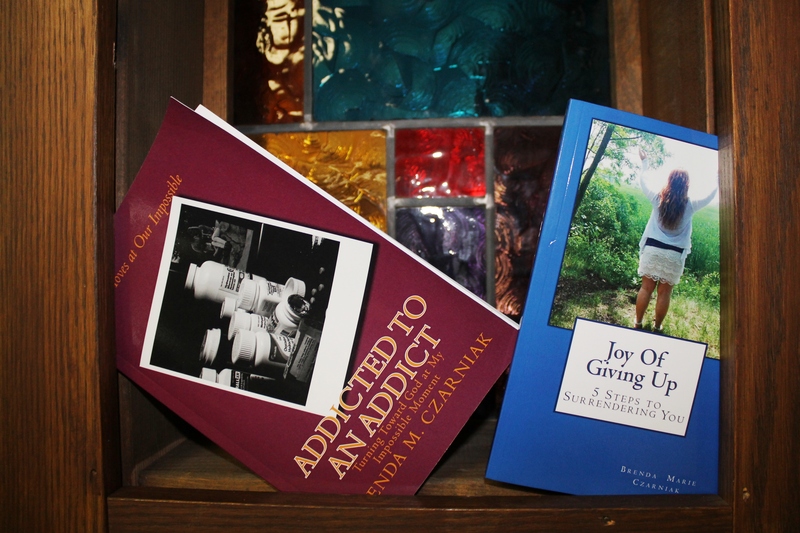 I have written two complete books and just waiting for publication funding to roll right in. I am working on the third book while I wait….but I am just not sure why I am stuck in this mode of wanting to just not move. I recently attended a church service and God showed me how many of us sacrifice things. We extend our arms out in front of us as if we are setting something on a shelf with the intent of gaining easy access to it when we need it. This is how I have been about my writing lately. I surrender the book publishing over and over and over and over it seems like, yet nothing moves. Then I pause to reflect on what a pastor once mentioned in a sermon. When you are stuck you need to go back the last word you got a word from God and start from there. Hmmmm…write the third book. That was the word. Am I doing that now? Nope! Keep putting it on the back burner, KNOWING, the other two have gone nowhere so why bother….sigh! Not the idea God has in mind for my future I am sure. The rest of the vision I saw was that God was asking us to place things we intend to give to Him on the highest shelf possible. Instead of the offering being right in front of us we need to raise both of our arms in COMPLETE surrender so that we will be less tempted to try to get in back into our own hands. So what now? I have two options: Quit or Write the third book. It’s always up to us what we want to do because of our free will given to us by God, yet we can never reach our destiny if we don’t listen for God’s still small voice to guide us along the way. It is completely up to us if we want to do what He asks of us but I can tell you without the shadow of a doubt that you will stay right where you are if you do not complete the assignments. So do you feel stuck? Feeling like it’s not even worth pursuing your dream? Well I am writing this blog as a pep talk to both of us then…pick up where you left off. 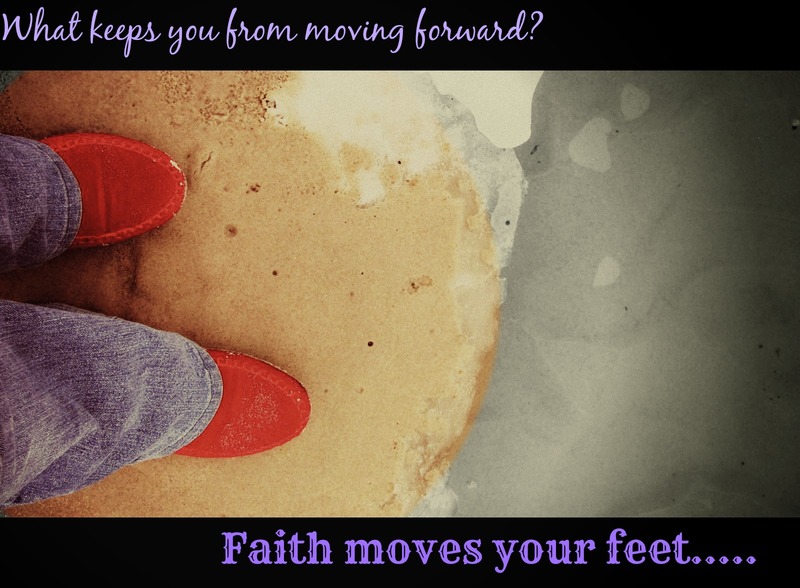 Put your feet in motion to the rhythm of faith and keep pressing forward into the things God has planned for you. I wonder how many of God’s people give up right before the biggest breakthrough of their lives? Let us not be counted among that number. Just think—you don’t need a thing, you’ve got it all! All God’s gifts are right in front of you as you wait expectantly for our Master Jesus to arrive on the scene for the Finale. And not only that, but God himself is right alongside to keep you steady and on track until things are all wrapped up by Jesus. God, who got you started in this spiritual adventure, shares with us the life of his Son and our Master Jesus. He will never give up on you. Never forget that. Sometimes we feel as if we have no purpose in life. We can’t decide when we leave high school what we want to be for the rest of our lives. There are times when we are just content to work our 9 to 5 jobs and just live day by day without anything changing. Do you know that each of us has a gift? We have all been given a special way in which to reach others and change lives? Once we begin our lives as Christians we take up the cross of Jesus and begin to bear witness of the Gospel and its’ message. We have been commissioned to share the Good News with everyone we meet and to love one another. How come we find this so hard to do? Because some of us have not opened our very own gift. God loves us to such a degree that He gives us good gifts in which we can use to show others the light of Christ. Remember we are the light in the darkness of this world. 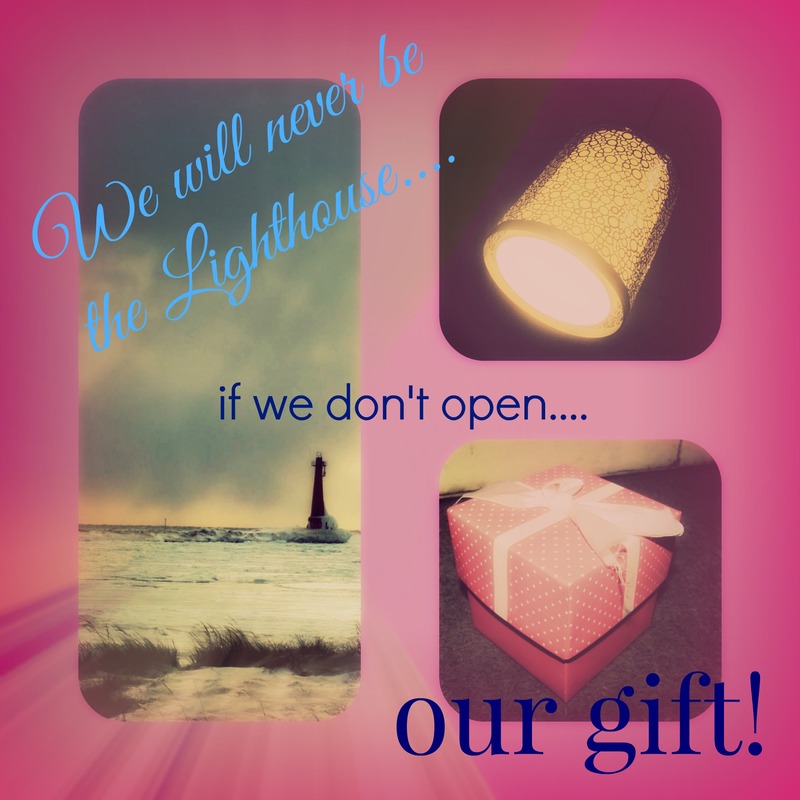 This week we will dig into the gift and how we use and abuse it. For me my gift is writing. I have loved to write since I was in kindergarten and wrote my first poem. I love stringing words together and now that I am older I am challenged with helping others see Christ through my writing. I have two books written with a third on the way. I blog as often as possible, yet I feel that sometimes it does not matter. Am I doing enough? The answer from God is yes. My gift is writing, not starting churches or traveling at this point. The gift God has given to me is writing and He knows I love it. I am not saying that someday my writing won’t lead me to start a church with my husband or travel the world but for now I need to open my gift and begin to use it. So, what is your gift? Have you even opened the box yet? We are never to young or to old to receive from God. I guarantee that God will move on His own timing but we have to be willing to at least open the gift. We have to be willing to take the steps to develop our gift. We need to come to the understanding that lives can be saved and we have been given a gift in which to do so. So I challenge you to open your gift and begin to explore the possibilities God has set right before you!